A segmented credit card promotion returns triple the average account growth at Truity FCU. The credit union relies on a combination of communication and criteria management to make pre-approvals easy to offer — and accept. There’s little friction in that user experience, and members have taken note. 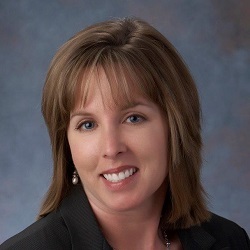 “One of our members, who works for a credit union league, told me it was the easiest acceptance he’s ever seen,” says Amy Grose, Truity’s vice president for marketing. For members who already have a Truity credit card, the credit union has an easy way for them to access more credit. Twice a year, it reviews current card holders and sends eligible members an offer for a credit line increase. If accepted, those members qualify automatically and the credit union sends a confirmation for when the additional funds — typically in the $5,000 to $10,000 range — will be available. Truity kicked-off this automated pre-approval program in 2012 as a way to nurture its consumer lending. It’s an easy process for members, yet a human still reviews who has clicked to accept, so fraud has remained low. In the past six years, Truity’s card portfolio has steadily grown and is now above average for its asset-based peer group. Its ratio of credit card loans to total loans has also increased. 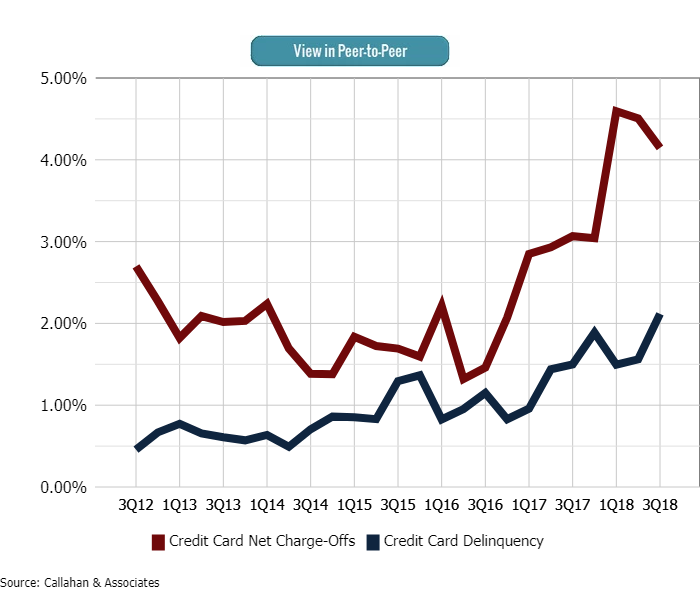 After peaking in 2016, Truity’s credit card loan growth dropped sharply as the credit union shifted emphasis to deposit growth and stiffened credit parameters as delinquencies grew. 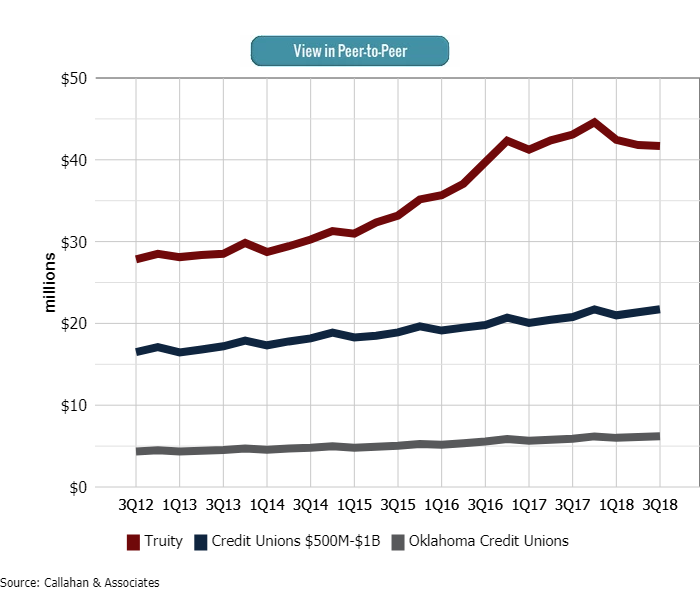 Truity’s credit card balances of $41.7 million in the third quarter of 2018 were nearly twice that of the $21.7 million on average for credit unions in its asset band. 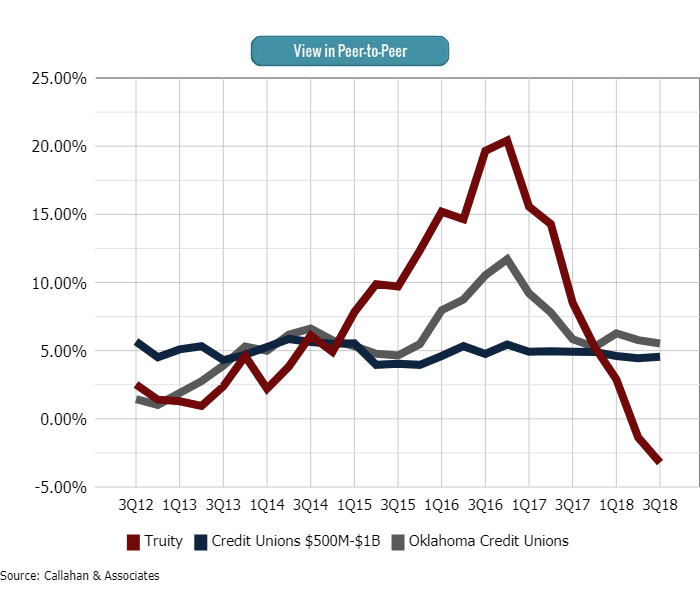 Since it began its pre-approval program in 2012, Truity’s ratio of credit card loans to total loans has been consistently higher than its asset-based and state peers. The credit union has discovered offers specific to travel-related expenses, like gas and hotels, resonate more with members. Truity has tightened its lending criteria and boosted charge-offs in response to a spike in delinquencies in the past year. Although the credit union pulls the reports and calculates rankings bi-monthly, it doesn’t always send the email promotions on the same schedule. Those communications hinge on Truity's larger priorities. 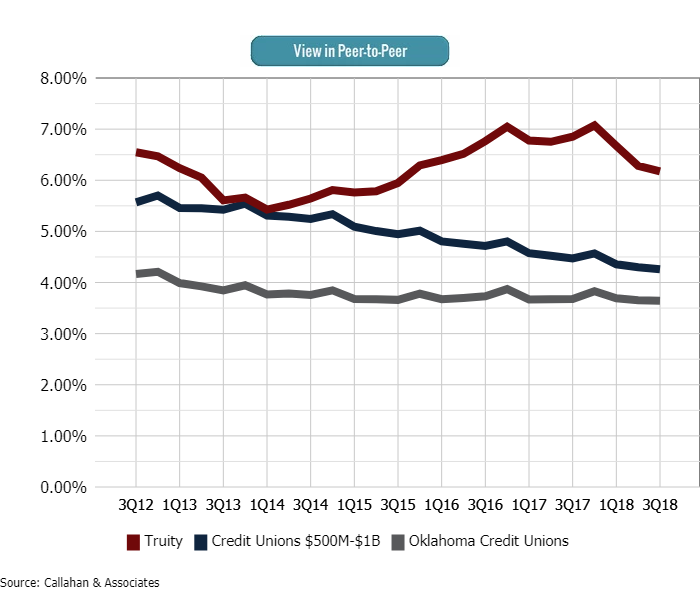 For example, because the credit union was more focused on deposit growth in 2018, it didn’t send the first credit card outreach until May. Because of this controlled growth, the credit union opened 575 new card accounts in 2018. That’s well below the average openings Truity has racked up since the pre-approval program began in 2012. That’s a substantial jump, and a shift to deposit growth isn’t the only reason for pumping the brakes on new card growth. Rising delinquencies has spurred Truity to tighten lending criteria and raise its charge-off frequency. But when the need arises again to charge up the charge cards, Truity knows the formula. It takes minutes to compare various aspects of your organization’s portfolio to other credit unions with Peer-to-Peer.